The fleur de lis is a symbol that you do not typically see associated with pirates: elegance and piracy do not normally go together. But we have added our own twist to this noble symbol, and in turn, have given you the Pirates Fleur de Lis Arm Bracers. This fleur de lis has almost nothing floral or noble, really about it. It is made up entirely of bones. Two large bones form the middle leaf and stem, while two curling bones jut out from the sides. The whole thing is bound like a twisted bouquet by a pair of crossed bones around the lower-middle. This wicked symbol is engraved onto a hand-made bracer and offered direct to you. Made from quality leather, either thick 13/15 oz. leather or flexible 7/8 oz. 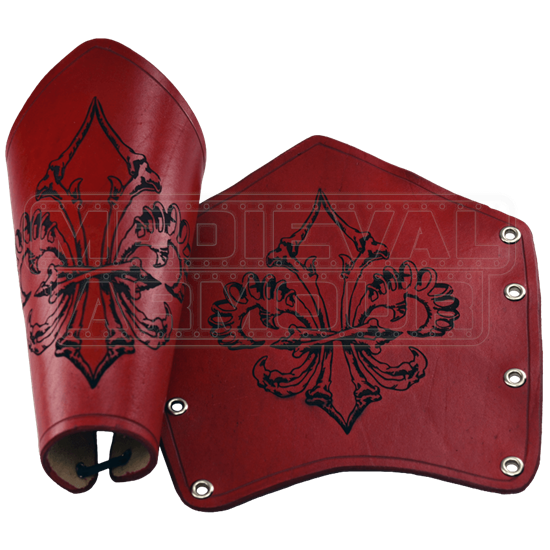 leather, your choice, to the highest standards, this leather bracer is the perfect accessory for any pirate or brigand who wants an aggressively elegant symbol. When worn, the given leather lace is threaded through the eyelets and pulled tight to secure it firmly to the arm. You may not see a pirate and a fleur de lis together every day, but the Pirates Fleur de Lis Arm Bracers certainly do pull the combination off with style.